"I recently upgraded from Tiger 10.4.11 to Leopard 10.5.6. Everything seemed fine, except for a drastic slowdown in my dial-up internet access via the internal modem. Oddly Safari and Firefox ran fine, but my Mail and FTP/Telnet were crawling under the new OS. "The solution that worked for me was to uncheck the 'Use TCP header compression' setting...."
"BMW Designworks actually assisted with the industrial design of the new HP workstations. They're handsome machines, but not exactly pretty - certainly not in the way Apple's Mac Pro is. "More importantly, however, the HP-BMW design is functionally superior. In about the same case size as the Mac Pro, HP's Z800 has room for more RAM, more expansion cards, and more disk drives. BMW also worked handles into the design, and they work better than Apple's...."
"It's expensive, but the Mac Pro's price is justified by the raw power of the Xeon processor. "The recent updates to Apple s iMac and Mac Mini desktop systems rather suggested that the company was treading water. Both machines sported new graphics chips and faster system buses, but their processor speeds had barely changed and there was a steady trend towards higher prices that suggested Apple was planning to weather the recession by padding its profit margins as much as possible. "We have to admit that we were rather impressed that the machine didn t crash when we accidentally opened up the wrong drive bay and pulled out the hard disk by mistake. We just slotted the disk back into place and the machine seemed to carry on without a hiccup." "Though we have the iMac with the CTO Radeon HD 4850 on order, we decided to post some 3D Game results for the iMac 3.06GHz with GeForce 130 GT to appease the restless natives. "Remember when the iMac was laughable as a game platform? Nobody is laughing any more...."
PR: IDrive for Mac is a user-friendly, secure and reliable application that performs automated online backup of your files and folders. The application safeguards your critical data. The graphical interface is coupled with powerful scheduling and logging features. iDrive for Mac Finder Plug-in also available - integrates with Mac OS X, making access to your IDrive account on Mac as easy as opening a Finder window. Just drag-n-drop the files/folders that you need to backup or restore. While IDrive for Mac application is optimized for best performance, for a quick look and easy drag-n-drop, the Finder Plug-in is a useful tool. iDrive for Mac-Windows Restore Plug-in makes data restore from Mac OS X to the Windows platform easy. The key features include quick search to easily locate backed up files, Snapshots for historical view of data and logs for details on the restore operations. Get 2 GB of backup space absolutely free without any catch. Store your photos, media files, or other important documents. Best suited for individuals and families. Option to upgrade to the IDrive Pro version depending on your requirements. Ideal for small and medium businesses or individuals with very large backup needs. For a small fee, this service gives you 150 GB of storage space for your backups. System requirements: Mac OS X 10.4 or later. PR: nova media has unveiled iCON 225, a sleek and afforable 3G USB modem for Macintosh computers. The iCON 225 supports fast HSDPA connections with up to 7.2 Mbit/s download speeds as well as quad-band EDGE and GPRS. "The iCON 225 is a relieable and afforable 3G modem for the Mac community, which is not SIM locked or otherwise bound to a certain provider or network." states Jan Fuellemann, PR spokesperson at nova media. "The iCON 225 supports the fast HSDPA protocol in all 2100 MHz networks, which are common in Europe and Asia. In most other countries, EDGE and GPRS are supported which offer speeds up to 220 Kbit/s in downloading data and up to 120 Kbit/s in uploading data." The iCON 225 includes the internet connect wizard launch2net for Mac OS X. This software offers a one-click connection to the Internet without the need to enter cryptic configuration details. launch2net already includes connection settings for most mobile network providers worldwide and offers a comprehensive connection statistic. Pricing and Availability: The iCON 225 is available today from nova media for Euro 117,- (plus sales tax if applicable) and requires Mac OS X 10.4.11, 10.5.2 or higher. A lanyard and an USB extension cord comes with the modem. PR: ZoHo is a richly featured online word processor that can be used for free (and ad-free) by individuals and up to 10 users in a business. Elegant toolbar with menu items neatly grouped in context-based tabs. Easy availability of all the toolbar features from a drop-down menu too. Sharing & Collaboration Easily share your documents online, with friends on an individual basis and in group. Collaborate on them in real time. Offline Support Access and edit existing documents even without an internet connection. Offline document edits will be synchronized when you are online. Post to Blog A nice way of sharing documents with the whole world. Make use of Zoho Writer's feature rich WYSIWYG editor for publishing your documents to blog. Import / Export Documents Upload documents from your desktop, Google Docs or anywhere on the Web. Download and save them to your computer too. Page View Editing Experience the joy of writing documents in a real paper like environment. Edit them the way you wish to see in print. Template Library Build your document by picking up from a collection of readymade templates from our template library. View Template Library. Quick Create Create documents on the fly without having to sign up or login. You can export them in different formats too. 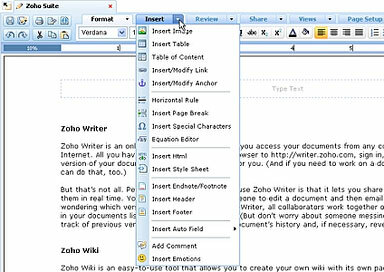 MS Office Plugin Work on your online documents in Microsoft Word and save them directly to your Zoho Writer account. Quick Read Plugin Open Microsoft Office & Open Office documents available on the web and save them directly to your Zoho Writer account. Zoho API An easy way of integrating Zoho services into third-party applications, portals or websites. Zoho Writer introduces MenuTab - a refreshing, elegant and intuitive toolbar with menu items neatly grouped in context based tabs. The simplified toolbar makes the end-users task that much easier in creating and formatting documents. Users also have the flexibility of navigating around any of the tab features with a single click of a mouse. Create documents on the fly using our WYSIWYG friendly editor and format the text contents as you like it with the options available under "Format Tab". Choose from the list of font faces (Verdana, Arial, Times New Roman etc) and apply varied font sizes too. Create headings for document titles and paragraphs. Make your text bold, italic, strike through and underline. Add subscripts(X2) and superscripts(X2) to your document content. Highlight text using colors, fonts and styles. Align text as Left, Right, Center and Justified. Alternatively, you can also make use of the following shortcut keys. Each tab in the toolbar comes with a drop down arrow that lists the features in the form of pull-down menu. Browse through the features and apply them to your document at the same time, using the pull-down menu, without having to navigate away from the existing highlighted tab. Insert/Modify Image - Spice up your document by adding pictures/graphics. Table - Add tables with specified rows and columns. Modify them according to your liking using "Table Properties" option. Table of Contents - Create a table of contents based on the heading levels and insert them in any section of the document. Links/Anchors - Link text to external sites or other pages within your document. Add anchors to navigate to a particular section of your document. Horizontal Rule - Insert a horizontal line between sections of your document and make it easily readable. Page Break - Define the length of your pages. User the page break option to manually insert page breaks anywhere in your documents. Special Characters - Add symbols and form equations out of them, using insert special characters button. Equation Editor - This comes very handy for writing mathematical stuff. Students, scientists, engineers can use the equation editor for writing scientific documents involving lots of equations. 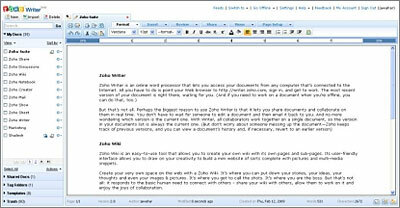 ZoHo Writer is free (and ad-free) for individual users and up to 10 users in a business. PR: iPresentee, the developer of add-ons for Apple's iWork and iLife applications, releases free Easter Mail Stationery templates to be used with Apple's Mail software. New Mail Stationery package includes ten templates. Easter fills us with hope, joy and warmth. It is a time to get together with friends, family and loved ones and celebrate this joyful time. Reach out to your dear ones on this Easter using free Mail Stationery templates from iPresentee. Creating an email with Easter Mail Stationery templates is exactly the same as creating an email using the ordinary Mail Stationery templates. Messages created with Easter Mail Stationery can be read by popular webmail services and email programs on both Mac computers and PCs. New Mail Stationery templates comes with an installer to make sure the templates end up in the right place and would be displayed in Apple Mail New Message Stationery menu automatically. Easter Mail Stationery templates are offered free of charge and requires any Macintosh computer running Mac OS X 10.5 with bundled Mail application. Free Mail Stationery templates for Easter holiday are available for download at the iPresentee's website. Samples and more information about Mail Stationery templates are available immediately at the iPresentee's website. PR: Easter-themed stationary for Mail.app. This pack includes 3 original Easter themes for Mail. On aMac Island you can download many themes for your Apple software like Mail. Download the new aMac Island Easter Mail Stationery pack. This pack includes 3 originals easter themes for mail. System requirements: Mac OS X 10.5 or later.